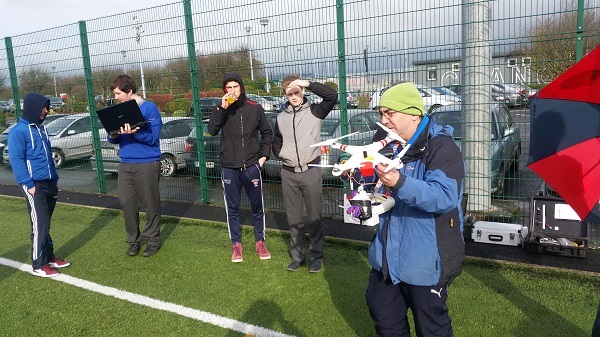 Tipperary Team Through to National Finals of the the European CanSat Competition! CanSat is an international competition thought up by the European Space Agency to promote science education among second level students. A CanSat is basically when we design, build and code a satellite that fits inside the size of a soft drinks can! When the satellite is launched, it needs to take readings from our sensors and we have the results live streamed to our website. from Vistakon in Nenagh called Hugh who made the day enjoyable also. On Friday, 4th of March 2016, our CanSat team – Copernicus IV, won the regional’s! 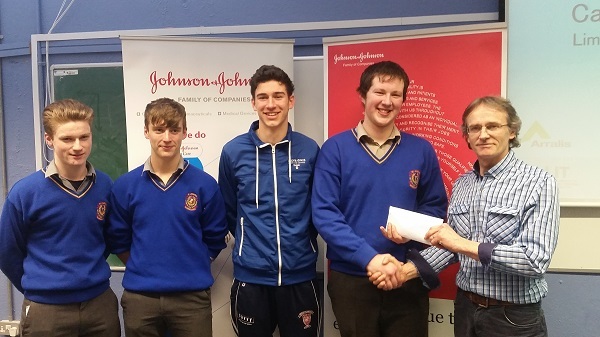 We are now through to the nationals in Birr Castle in April. probably the most exciting part of the day. 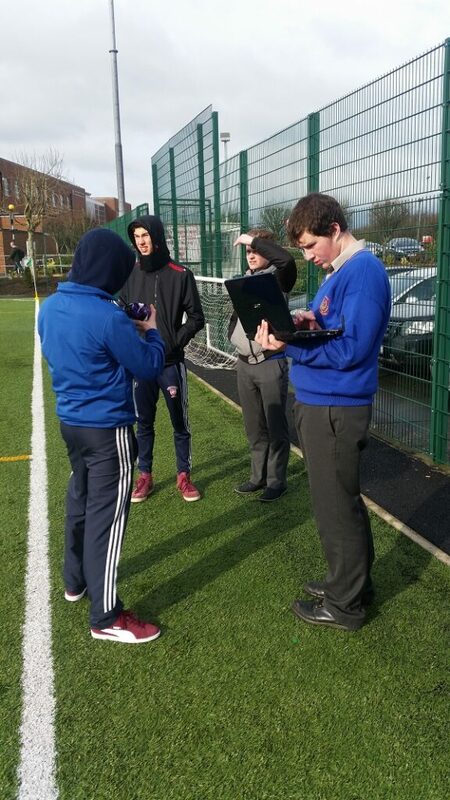 After that, we were confident we could do well once we got the correct data from our CanSat. We had practiced our presentation so we could deliver it and present ourselves well. We were all in shock when they called out our name as the winners. Now it is time to go back to the drawing board again to improve our design! We would like to take this opportunity to thank everyone who has helped us along our journey. Both our school and local community have been so supportive in everything and have shown us great interest. In our outreach programme, Paddy Ryan of tipperarytimes has also been very helpful! 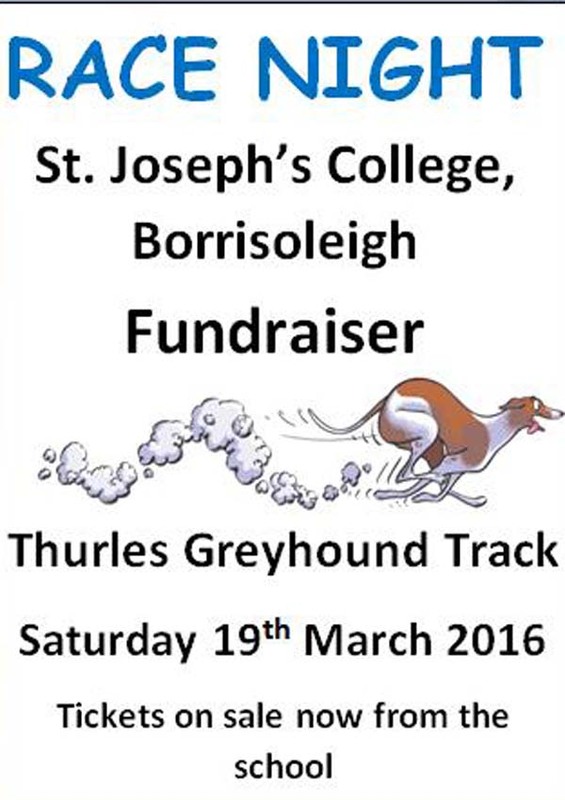 Excitement is building for St Josephs College Fundraiser Race Night at Thurles Greyhound Track on Saturday 19th March. Tickets are being sold by students and are also available to buy from the school. We look forward to a great night with students, parents and teachers. We hope to see you there! Track-Attackers Martin Maher, John Vahey and Tom Shanahan. With just 2 rounds of the Track-Attack Safari Team Trek which is sponsored by Camsaw Distributers Ltd (main suppliers of OleoMac and Weibang lawnmowers) left to go, it is virtually impossible to predict the outright winners. Any one of 10 or more teams could yet put a run together to get them over the finish line as Team Trek victors. The Rhinos are charging impressively towards the top of the table and now have the leading Gazelles clearly in their sights. Aoibheann Carr was their leading light in round 8 followed closely by Martin Fahy and James Gould. In total, their 7 scoring members on the night recorded a PB which in turn gained their team an extra 100 bonus points. Their performance on the night also showed what even a slight improvement in individual performances can do for their team. Deirdre Collins, Jack Galvin and Joanne Minogue gained 2, 6 and 9 points respectfully but these totals contributed enormously towards their bonus points. The Bears are also growling loudly in the background and could well be the team to keep an eye on over the last 2 weeks. Celine McCarthy’s performances in the last 4 weeks have contributed brilliantly towards their rise to the podium. In round 8, Michael Ryan, Emily Bourke and Jacqueline Minogue are were also in bonus territory while their other quintet of members namely Denise Gould, Paddy Kennedy, Therese Groome, Paddy McCormack and Sean Young have been adding impressively to the teams overall scoreline in recent weeks. For the second week running however, the Gazelles are gripping tightly to the leading position. They are showing how a team should work as the team members who miss out on a PB one week are stepping up to the mark the following one and as a result they are now the favourites to take the title. In round 8, it was the turn of Mary McLoughlin, Daniel Madden and Matilda Hayes to grab the headlines. The trio are joined by Siobhan Carr, Kelly Harrington, Clodagh Ryan, Ruairi O’Connell, Delia Ryan and Will Cooney on the leading team. Outside of the top 3, there were also some excellent performances from members of the other 16 teams. Patrick Tynan was the leading Lion on the night while Margaret Meehan tore up the track for the Tigers. Cathal Rabbitte was the leading scorer for the Cheetahs, our youngest performer Sean Og Hayes lead the way for the Leopards while Carol Treacy produced her best performance to date to be the highest scoring Puma. 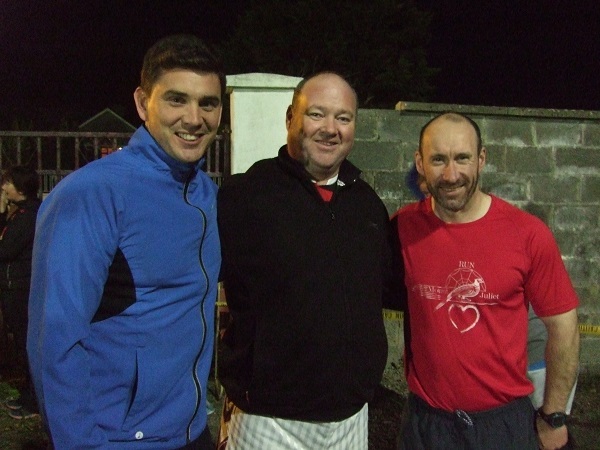 Team captain Richie Tynan showed best of the Warthogs, with Donal Ryan the strongest Buffalo on the night. 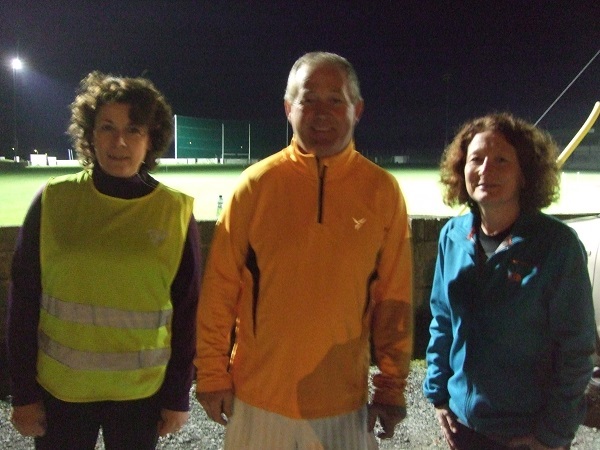 Johnny Maher stood out for the Hyenas, Marie McGrath led the Antelopes chase, Helen Hurley ruled supreme for the Zebras while Jim Costigan continued his highly impressive form with the Meerkats. The Wildebeests were led best by Aisling O’Connell, Pauric Stapleton hit the double maximum for the Crocodiles, the ever improving Paul Boyle was the supreme Impala, Lisa Kennedy just edged out Frances Stapleton as the leading Jaguar while the flying Bobcat team had Kathleen Ryan as their leading star on the night. The Bothy was set up as a community shop in Borrisoleigh which would act as a community space and an outlet for local artisans to sell their produce. The idea was that local food producers and craftspeople would have a regular outlet to sell their wares. It was also hoped that more people would be encouraged to begin earning extra income by producing food and crafts to sell in The Bothy. More income earned by local people would help the local economy as money spent locally stays locally. 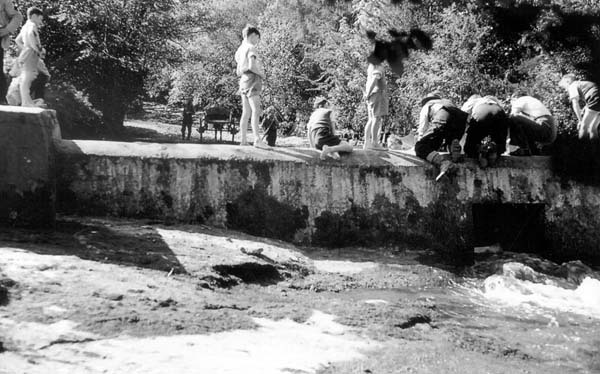 It was also an aspiration that The Bothy would become a community hub. A place where people could come together to share a cuppa, hold meetings or maybe learn something new as a group. The Bothy has been extremely fortunate and grateful to have had several volunteers over the years. It is one of the very few volunteer run community shops in Ireland today and has hosted visitors on educational tours from around Europe. However, we need your help to ensure The Bothy remains open. More craftspeople and food producers are wanted to keep the shelves stocked with as wide a variety of goods as possible. Would you like to earn a little extra income? Maybe put aside some money to pay for school books, holidays, college fees? Why not try your hand at producing some crafts or foodstuffs for sale? Maybe you already have a hobby that you could use to generate a little side income. 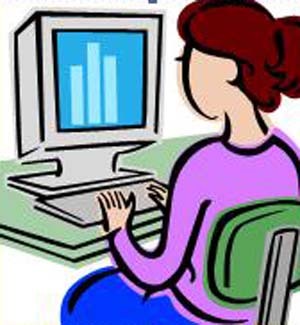 You can always learn new crafts by taking courses or even studying online through websites like www.craftsy.com. Volunteers of all kinds are always welcome. Maybe you can volunteer for one hour a month or maybe you can do four hours a week. It doesn’t matter. It’s a great opportunity to meet other people, have a chat and get to know your fellow parishioners. You might also have ideas and might like to host other activities in The Bothy similar to the Bookclub. For instance poetry readings, sewing circles, family history research, whatever. Any time you can donate is greatly appreciated. If you want to get involved in any capacity we’d love to hear from you. Customers of course! Last but by no means least The Bothy needs customers. Even just popping in for a quick cup of tea or coffee can make all the difference if enough people do it. While The Bothy is a not for profit organisation, there are still running costs which need to be paid. Why not make a point of meeting friends for a cuppa once a week or once a month or whenever you can. Better still if you can support some of the local food producers or craftspeople. Unless the issues above are addressed it will not be possible for The Bothy to stay in business. If you can help out or contribute in any of the ways mentioned above please call in let us know. We’d love to hear from you. 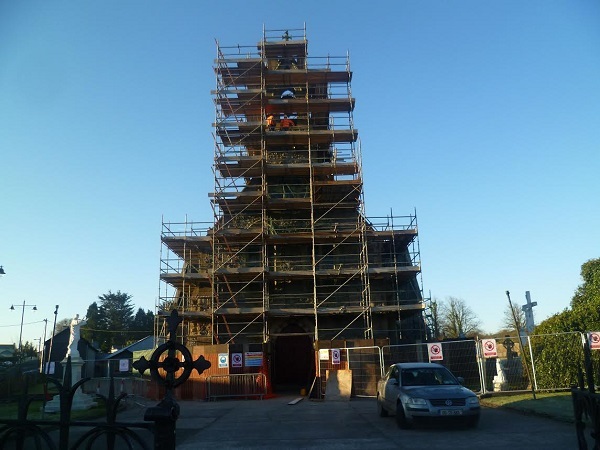 Our Sacred Heart Church is under repair at the moment. 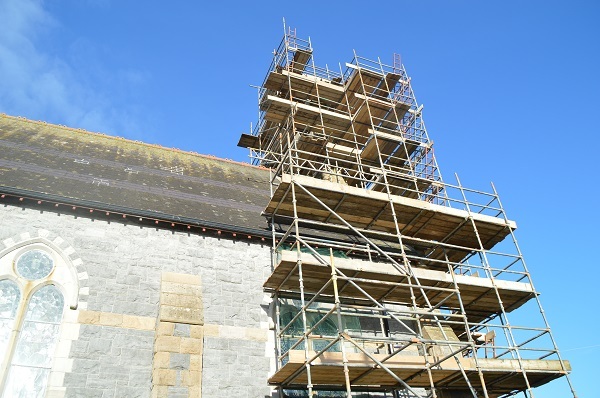 Scaffolding has been erected to repair leak in Gallery, Bell & Bell Tower and Pointing. Sorry for any inconvenience caused. March 15th, 2016, has been designated ‘Proclamation Day’ for schools. As part of the Ireland 2016 Commemorative Programme, schools throughout Ireland will use the day to commemorate and reflect upon the events of 100 years ago. 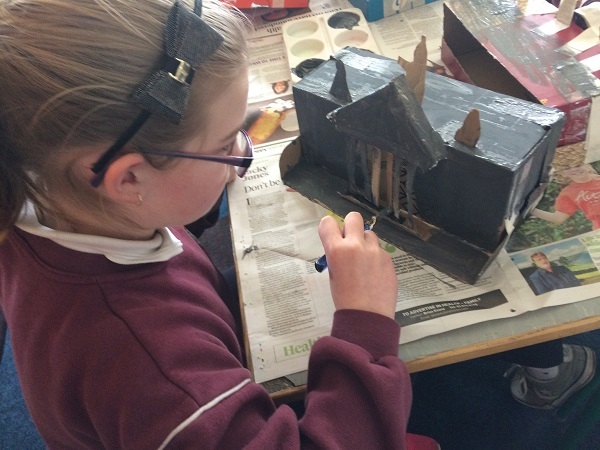 Pupils and staff of Scoil Naomh Cualán have been working hard in preparation for our Proclamation Day ceremony which will celebrate this important event in our history and proclaim our ideals for the future as we launch our 2016 Proclamation for a New Generation. In addition to reading the 1916 and 2016 Proclamations pupils will lead a memorable presentation of music, drama, poetry, song, visual arts and IT to mark this special day. Following the ceremony we will raise our National Flag outside our school. Our 1916 commemoration will commence at 11.a.m. on Tuesday,March 15th. Recreating scenes from the 1916 Rising, Countess Markievic and Éamon De Valera are released from prison. 1916 art and design, making replicas of the G.P.O. Borris-Ileigh camogie club have been included in Tesco sponsorship for clubs, so the more tokens that are collected in Tesco Thurles, the more funds could be generated for the club. We would really appreciate your support and many thanks to Tesco Thurles. Fantastic win for the Seniors last Saturday v Moneygall. Winning 5-07 to 1-03. 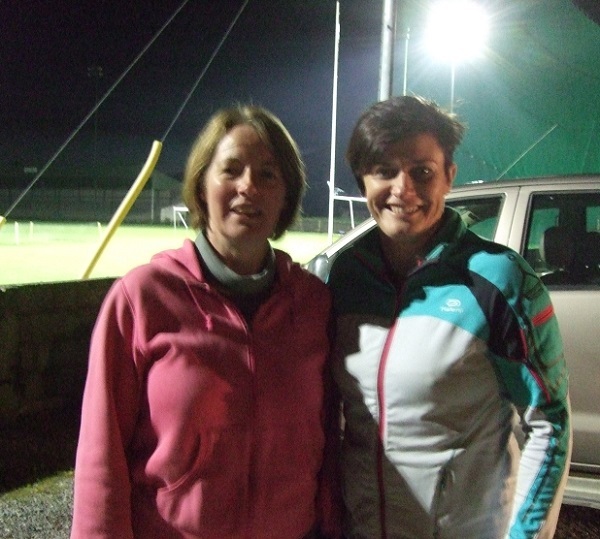 Scores from Nicole Walsh 1-05, Niamh O’Donoghue 0-02, Mary Bradshaw 3-00 and Eimear Lyons 1-00. Fantastic debut for the back line of Avril Ryan, Julieanne Burke and Kate Delaney. Well done girls. 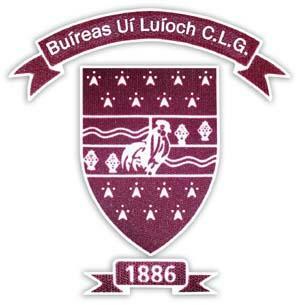 MOYLE RVRS V BORRIS-ILEIGH postponed to this weekend. All roads lead to Moyle Rovers this Sunday at 12 p.m. for this debut outing for our new Junior B team. The very best of luck girls. New players always welcome. The Juvenille Club will be holding a registration day this Saturday 12th in the pavillion from 1pm to 3pm. We urge as many people to get down and get your membership and insurance paid. The rate is €25 per child or €50 per family. It is vital that this gets played as players cannot take part in games without insurance. Senior League: Borris defeated Knockavilla in the first round of the county league on Sunday morning in Borrisoleigh. It was a fine workman like performance despite the very tough conditions. We will play the next round the weekend after next. 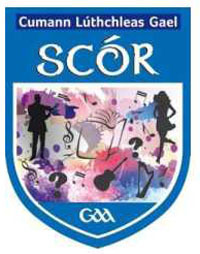 On Sunday next the county final of Scór na bPáistí will take place in Cashel. We would like to wish our novelty act the very best of luck. This is the fifth year in a row that we have a novelty act reaching the county final. On Friday night last the north B final of Scór na bPáistí was held in the Marian Hall. Congratulations to Aoife Fitzgerald who won the recitation competition. 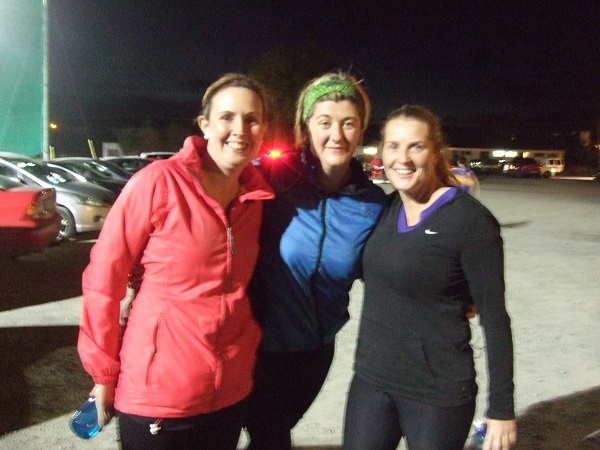 Our Léiriú group performed in the Munster Final in Ovens in County Cork last Saturday night. Unfortunately they were not victorious but well done to all involved. 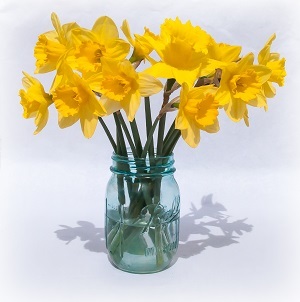 Daffodil Day will take place in Borrisoleigh next Friday 11th March. Volunteers will be located in the Square, Hurley’s and Centra. 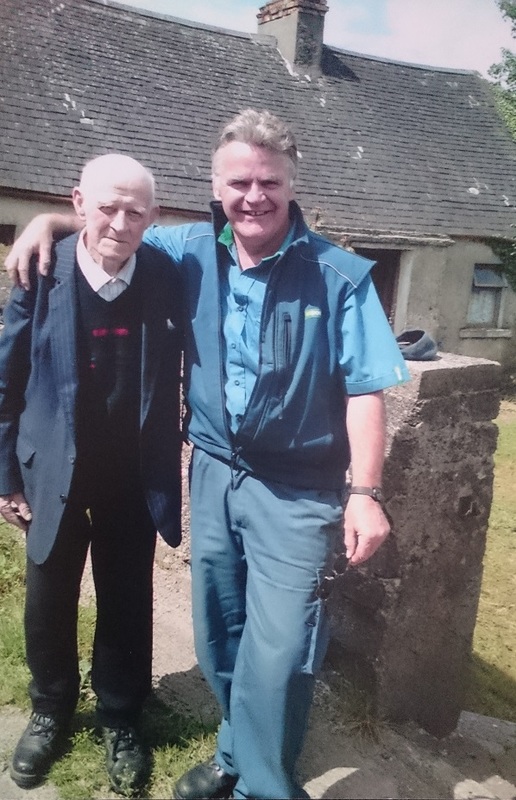 The late Jimmy Murphy of Glenkeen with former postman Michael Revins. Photo taken circa 10 years ago. Council workers opening the trap-door at the Sandtrap, to facilitate the removal of sand and gravel.